: viii + 88 Pages, Index, Biblio., Size : demy i.e. 22.5 x 14 Cm. In this original and significant study the author tries to show biographical and historical background of the academic achievements of Albiruni, the scholar of Science and human ties, the eleventh century Arab historian who composed hundreds of books on different subjects. His monumental work entitled ‘Tahqiq ma-lil-Hind, was written on the material life, culture, history, philosophy and science of Indian people. 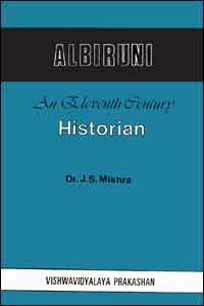 The present book for the first time throws light on the method, approach, treatment of history and historiography of Albiruni who supplies ample information about this country. In this regard he surpasses the Greek traveller Magasthanese and Chinese traveilers Fa-Hian and Hiuenisang. Contents : Preace, 1. Albiruni’s Life and Career, 2. The Treatment of History in Tahqiq-Ma-Lil-Hind, 3. Albirunis View About Hindu Social Formation, Bibliography, Index.